This mother wrote a wonderfully kind article about The Incredible Years® that was published in her local paper, as well as two detailed blog posts (PART 1 & PART 2) dedicated to her experience – which you can find on her parenting blog, The Motherhood Project. Ashley’s blog posts come from an honest and reflective perspective – she discusses her initial hesitance to attend a parenting group and how it eventually helped her family. “I’ve just finished IYP for the second time! I chose to take the course a second time because it was easy to slip back in to bad habits and I enjoyed the extra support from the group. This time I did it with my partner, which was awesome and well worth the juggle to get time off work, because then we could parent together and support each other. The strategies are simple yet very effective – and they really work! What I love most about The Incredible Years® is that it is based on a foundation of a respectful relationship with your child. We adopt an attachment parenting approach in our home and The Incredible Years® builds upon that. Thus, parenting is more positive-focused using these techniques and each day with our children is happier. It is so incredible to hear about their experience using the program and the effect it had on their lives as a family. Thank you Ashley for your willingness to share and be open about your experiences. These stories are what keep us going! Categories: Guest Blogging, Incredible Years, Testimonials | Tags: Autism Spectrum, Children, early childhood education, ODD, Parent Testimonial, parenting, Parenting Class, The Incredible Years | Permalink. In our previous post, we discussed how the Incredible Years® (IY) Parent and Teacher Programs have been researched and proven effective in Head Start settings. The IY Child programs have also been studied in a Head Start environment (in conjunction with IY Teacher program), in both a larger classroom prevention setting as well as a smaller treatment group setting for children. 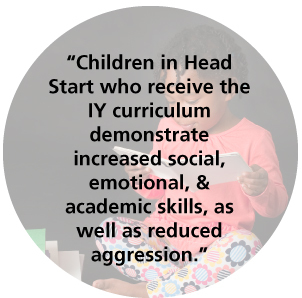 The studies illustrate how children in head start who receive the IY curriculum demonstrate increased social, emotional, and academic skills, as well as reduced aggression. By implementing interlocking programs for parents, teachers AND children, this allows for greater results and consistency for everyone involved. Read on to see how IY Programs have been successful in head start classrooms as well as with groups of children with ADHD and ODD. 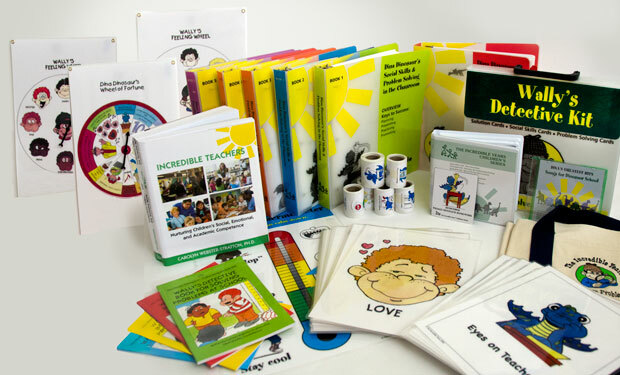 Over the past 20 years, a half dozen randomized control group studies in the US, Wales and Ireland have shown that using the Incredible Years (IY) Teacher Classroom Management Training Series in Head Start or Sure Start (in United Kingdom) results in significant improvements in teacher’s use of student coaching methods, praise, proactive discipline and classroom management strategies. In addition, intervention classrooms (where teachers received IY training) showed increased student positive interactions and cooperation with teachers and peers, school readiness and engagement with school activities compared with control classroom students. Additionally, intervention classrooms had significantly reduced peer aggression than control classrooms. Webster-Stratton, C., M.J. Reid, and M. Hammond, Preventing conduct problems, promoting social competence: A parent and teacher training partnership in Head Start. Journal of Clinical Child Psychology, 2001. 30(3): p. 283-302. Hutchings, J., et al., Early results from developing and researching the Webster-Stratton Incredible Years Teacher Classroom Management Training Programme in North West Wales. Journal of Children’s Services, 2007. 2(3): p. 15-26. This study was designed to assess the effects of the Teacher Classroom Management plus the Classroom Dinosaur Social and Emotional Curriculum (Dinosaur School) for economically disadvantaged populations. Head Start, kindergarten and first grade teachers were selected because of their high rates of families living in poverty. Matched pairs of schools were randomly assigned to intervention or control conditions. In the intervention classrooms, teachers offered the Dinosaur School curriculum in bi-weekly lessons throughout the year. They sent home weekly “dinosaur” home activities to encourage parents’ involvement. Children and teachers were observed in the classroom by “blind” observers at the beginning and end of the school year. Results reported from multilevel models of 153 teachers and 1,768 students indicated that teachers used more positive classroom management strategies and their students showed more social competence, emotional self-regulation, school readiness skills and reduced conduct problems compared with control students. Satisfaction of the program was very high regardless of the grade levels. Webster-Stratton, C. and M.J. Reid, Strengthening social and emotional competence in socioeconomically disadvantaged young children: Preschool and kindergarten school-based curricula, in Social competence of young children: Risk, disability, and intervention, W.H. Brown, S.L. Odom, and S.R. McConnell, Editors. 2008, Paul H. Brookes Publishing Co.: Baltimore. p. 185-203. Webster-Stratton, C., M.J. Reid, and M. Stoolmiller, Preventing conduct problems and improving school readiness: Evaluation of the Incredible Years Teacher and Child Training Programs in high-risk schools. Journal of Child Psychology and Psychiatry 2008. 49(5): p. 471-488. Webster-Stratton, C. and K.C. Herman, Disseminating Incredible Years Series Early Intervention Programs: Integrating and Sustaining Services Between School and Home Psychology in Schools 2010. 47(1): p. 36-54. In addition to the evaluation of the Classroom Dinosaur program with a selected population of socioeconomically disadvantaged populations, four randomized trials have been conducted with children diagnosed with Oppositional Defiant Disorder and ADHD, using the IY Small Group Dinosaur Curriculum. 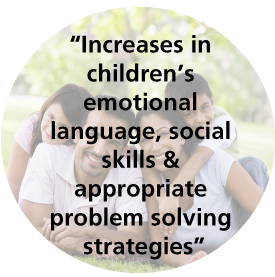 These studies have shown increases in children’s emotional language, social skills and appropriate problem solving strategies with peers as well as reductions in conduct problems at home and children. Webster-Stratton, C., M.J. Reid, and T.P. Beauchaine, Combining Parent and Child Training for Young Children with ADHD. Journal of Clinical Child and Adolescent Psychology, 2011. 40(2): p. 1-13. Webster-Stratton, C., M.J. Reid, and M. Hammond, Treating children with early-onset conduct problems: Intervention outcomes for parent, child, and teacher training. Journal of Clinical Child and Adolescent Psychology, 2004. 33(1): p. 105-124. Webster-Stratton, C. and M. Hammond, Treating children with early-onset conduct problems: A comparison of child and parent training interventions. Journal of Consulting and Clinical Psychology, 1997. 65(1): p. 93-109. Parents and teachers starting early to work together to build a strong foundation of social and emotional development in children is the most effective way to achieve optimal academic growth and school achievement and reduce delinquency and substance abuse. For group leader reflections regarding using the IY programs with Head Start, view this video! 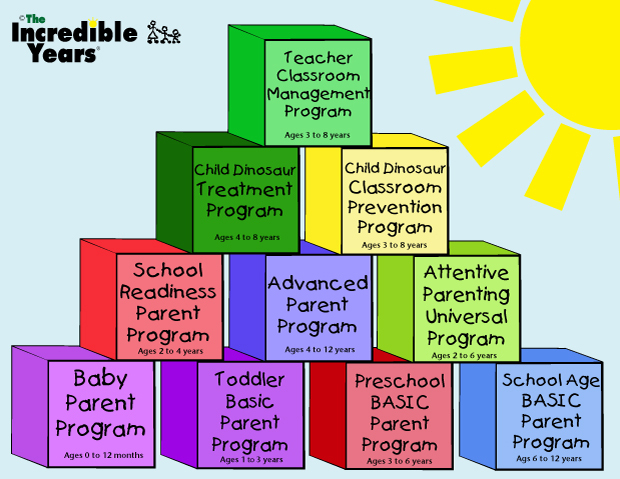 Categories: Head Start, Incredible Years | Tags: ADHD, Children, Classroom, Head Start, Incredible Years, ODD, School, Social Emotional Learning | Permalink.